Terrence O. Callier, known as Terry Callier (May 24, 1945 – October 28, 2012) was an American jazz, soul and folk guitarist and singer-songwriter. Callier was born in the North Side of Chicago, Illinois, on May 24, 1945, and was raised in Cabrini-Green, a Chicago neighborhood. He performered songs such as "Occasional Rain" (1972), "What Color Is Love" (1973), and "I Just Can't Help Myself" (1974). He also played with George Benson, Gil Scott-Heron and others. He signed a contract with Elektra Records, releasing the albums Fire On Ice (1977) and Turn You to Love (1978). 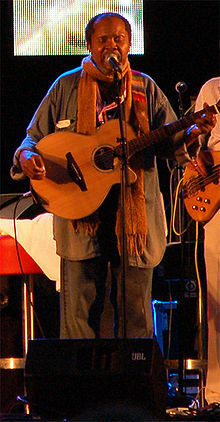 Callier died in Chicago on October 28, 2012 from cancer, aged 67. ↑ "Terry Callier Passes Away : MundoVibe | World Music & Visual Culture | Download Free Music". MundoVibe. 1945-05-24. Retrieved 2012-10-28. ↑ "Terry Callier, Singer and Songwriter, Dies at 67". Retrieved 31 October 2012. Wikimedia Commons has media related to Terry Callier. This page was last changed on 13 June 2018, at 02:33.